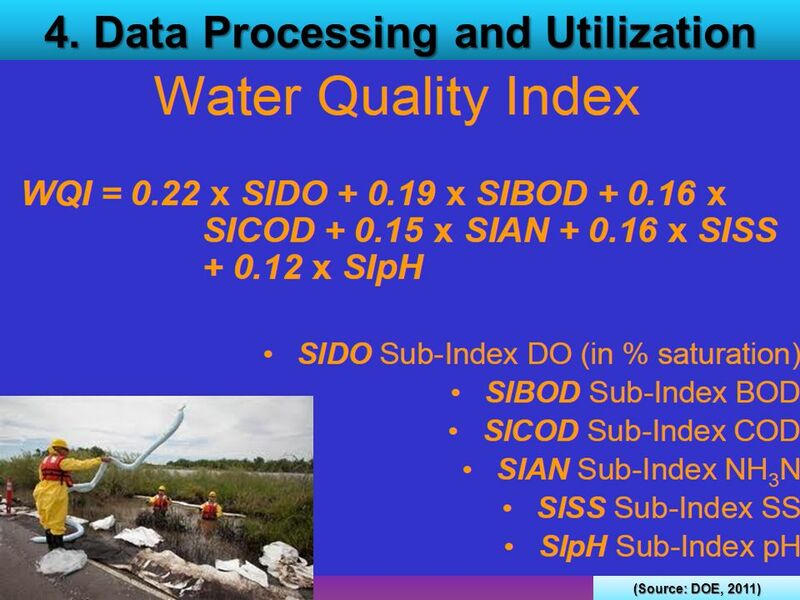 2 "Water“ is a key environmental issue. 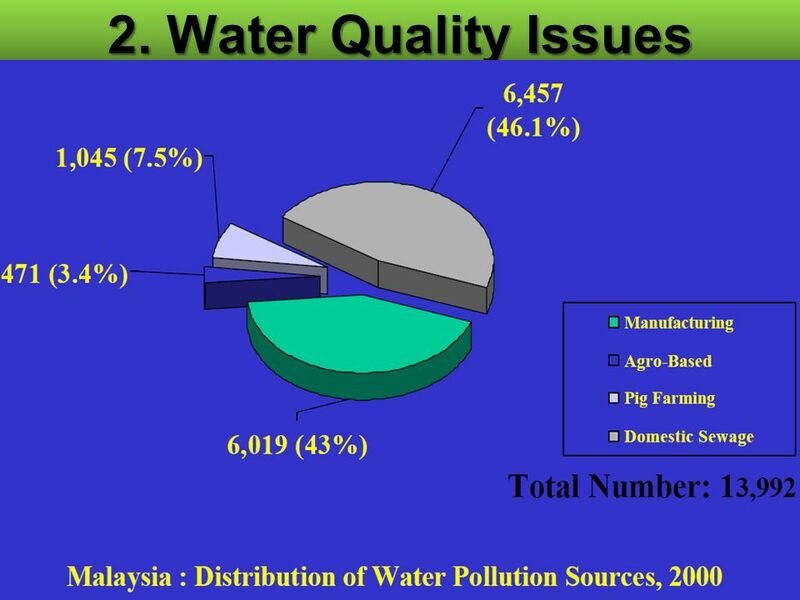 Water is a key environmental issue. 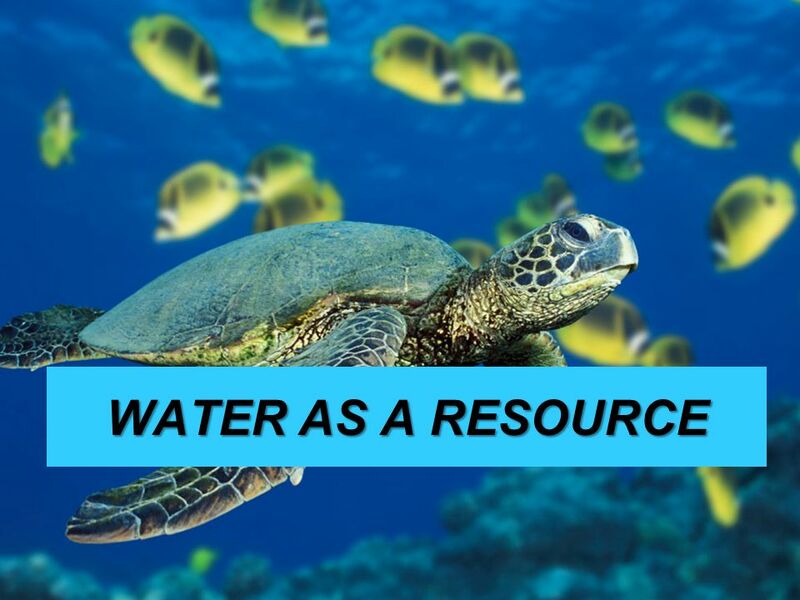 There concept of sustainable development is in managing the environment effectively and treating the environment as a common global good (example water). 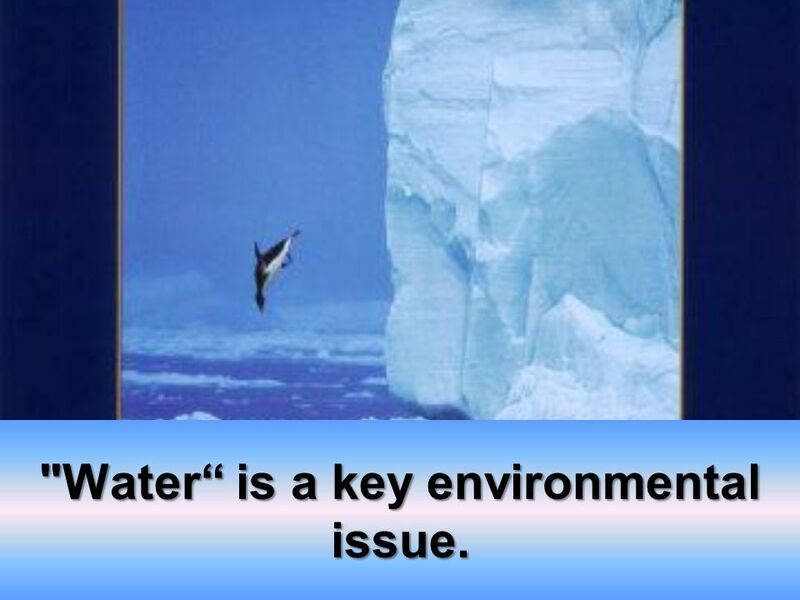 This is a basic discussion of a globally key environmental issue: WATER. 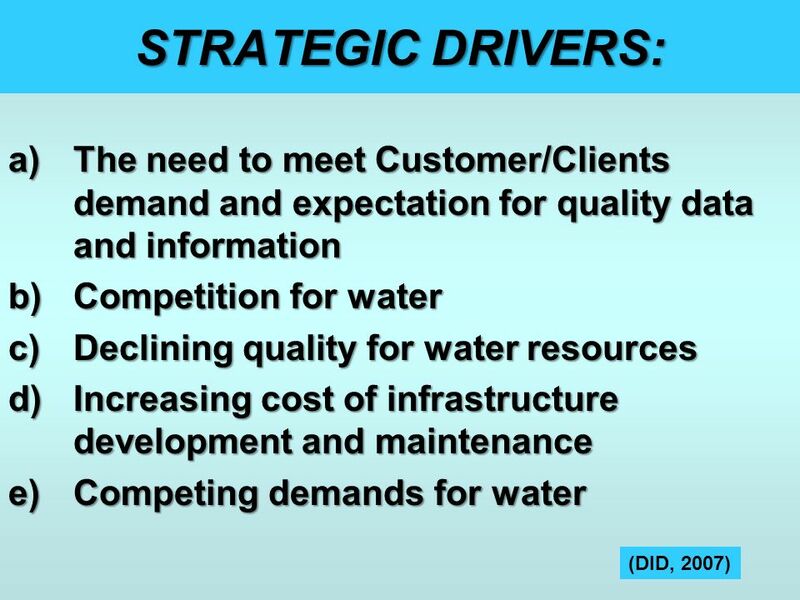 Water Demand: 60 % increase from 9,543 Mld in 1995 to 15,285 Mld in 2010 113 % increase from to 20,338 in 2020. 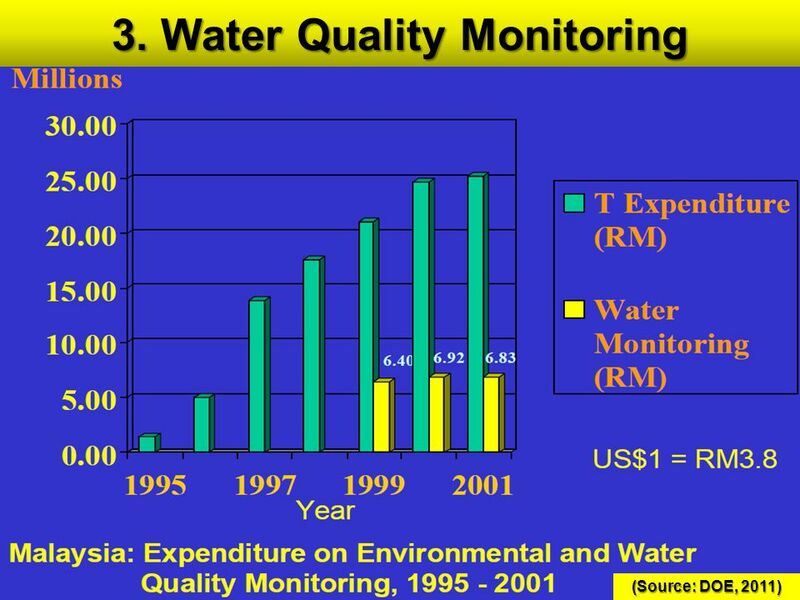 Several parts of Malaysia experience severe water shortages due to drought in 1998. 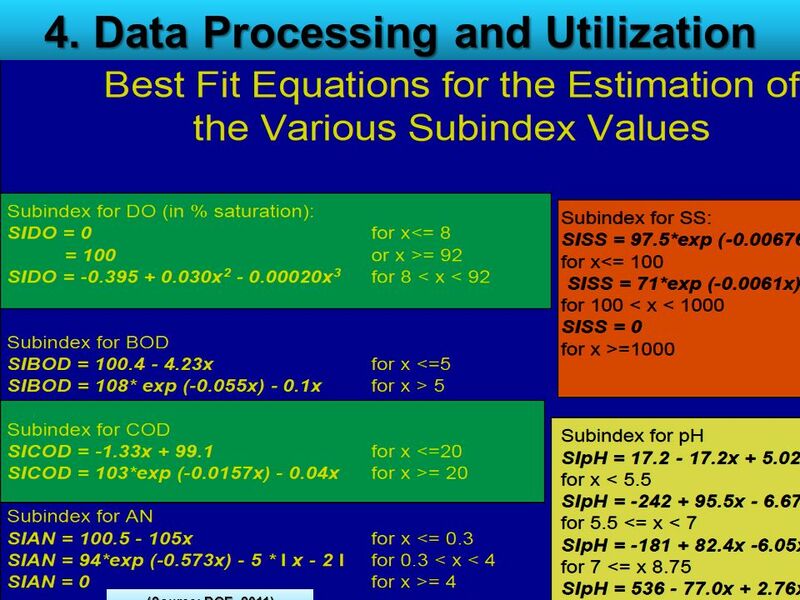 New source works for addition supplies to meet future needs. For e.g. 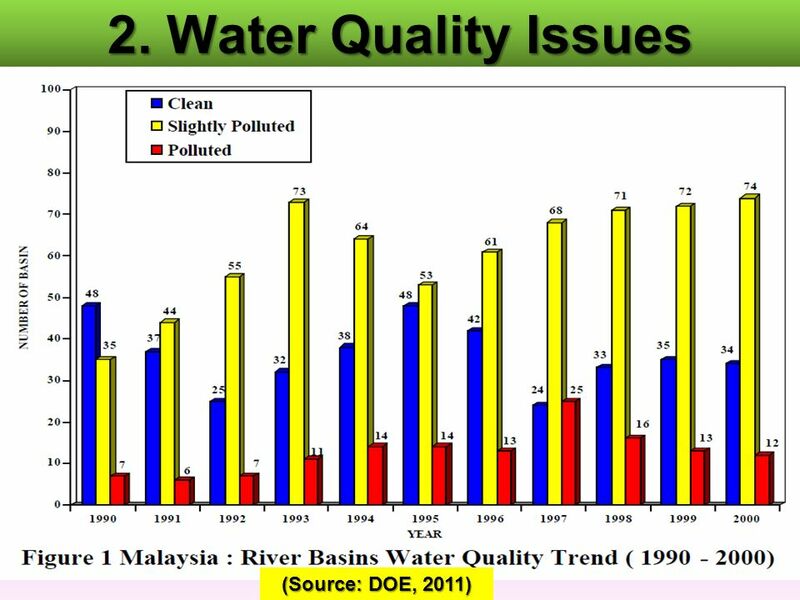 water from Pahang Rivers. 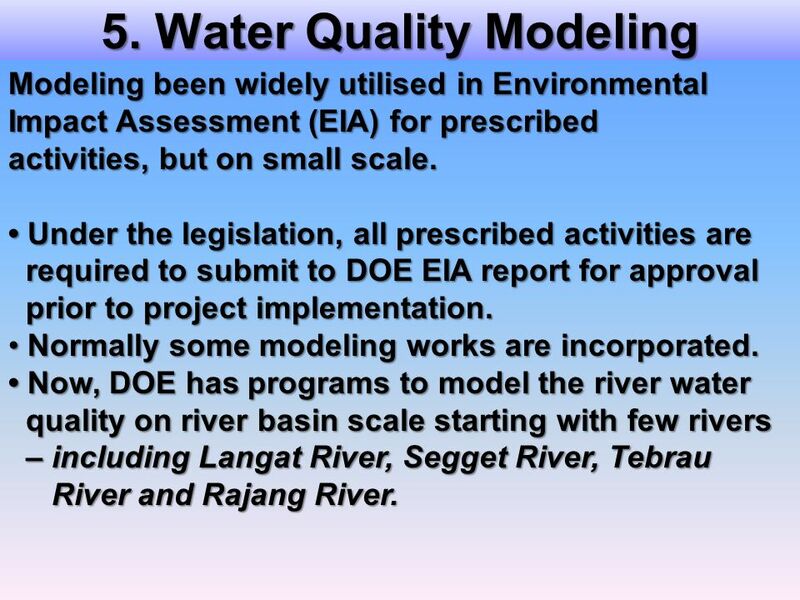 Modeling been widely utilised in Environmental Impact Assessment (EIA) for prescribed activities, but on small scale. 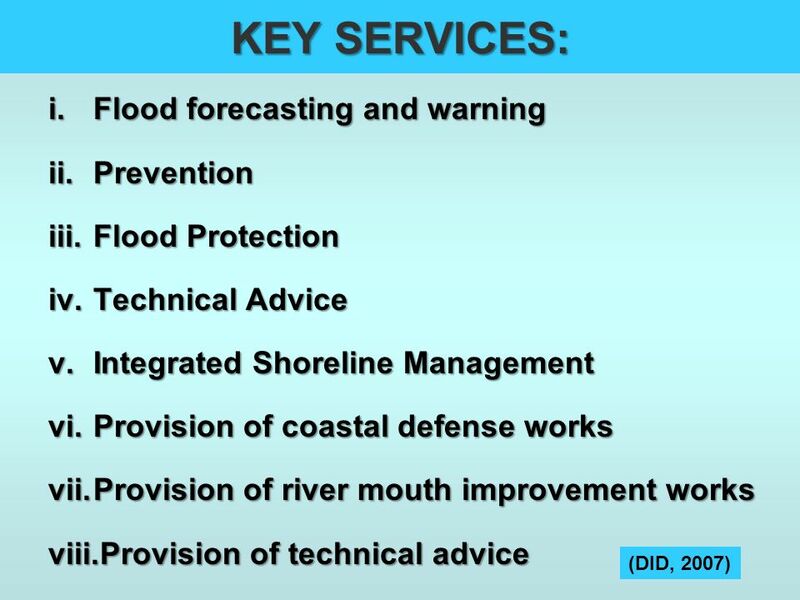 • Under the legislation, all prescribed activities are required to submit to DOE EIA report for approval prior to project implementation. Normally some modeling works are incorporated. 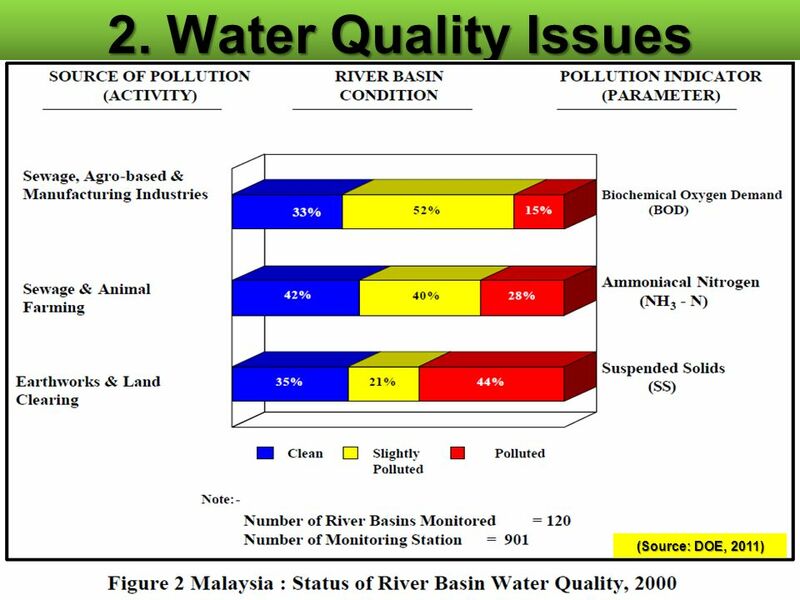 • Now, DOE has programs to model the river water quality on river basin scale starting with few rivers – including Langat River, Segget River, Tebrau River and Rajang River. 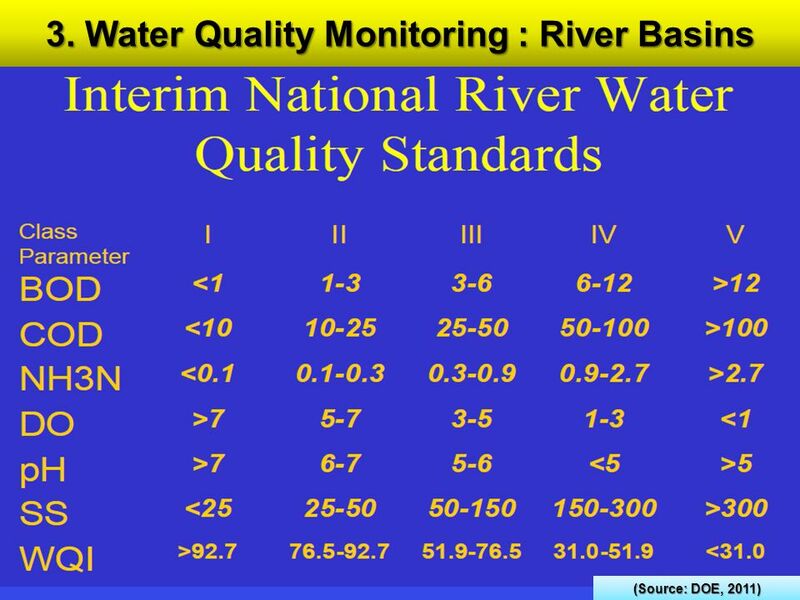 River classifications for major rivers have been completed. • Now 24 rivers. 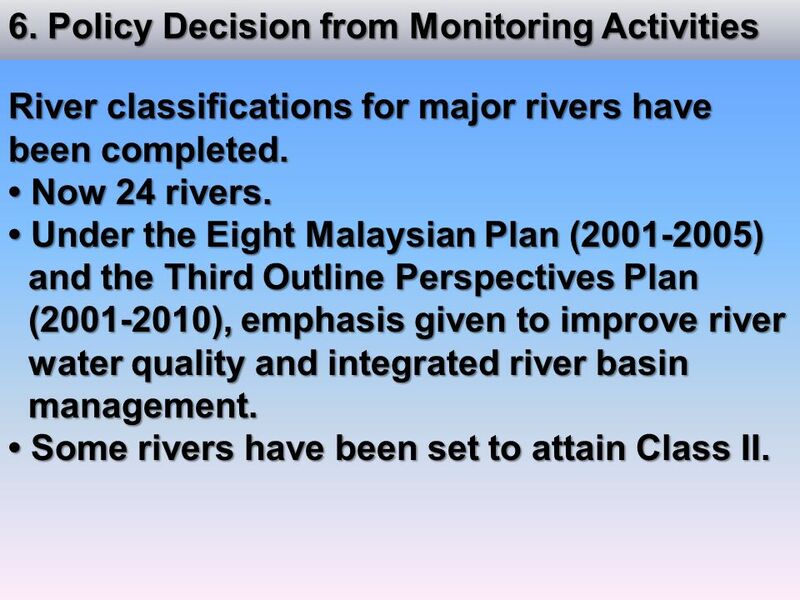 • Under the Eight Malaysian Plan ( ) and the Third Outline Perspectives Plan ( ), emphasis given to improve river water quality and integrated river basin management. 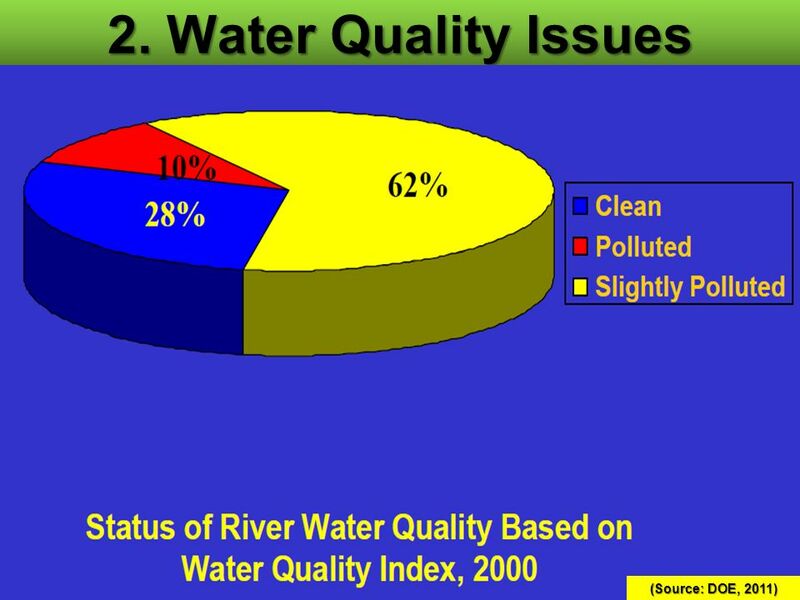 • Some rivers have been set to attain Class II. 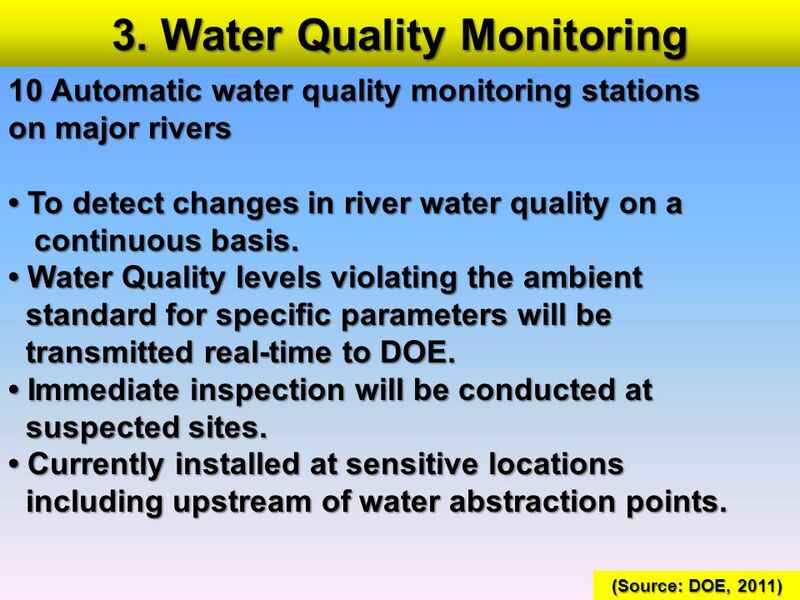 • Program for the pollution prevention improvement of river water quality has been planned and implemented as of 2001. 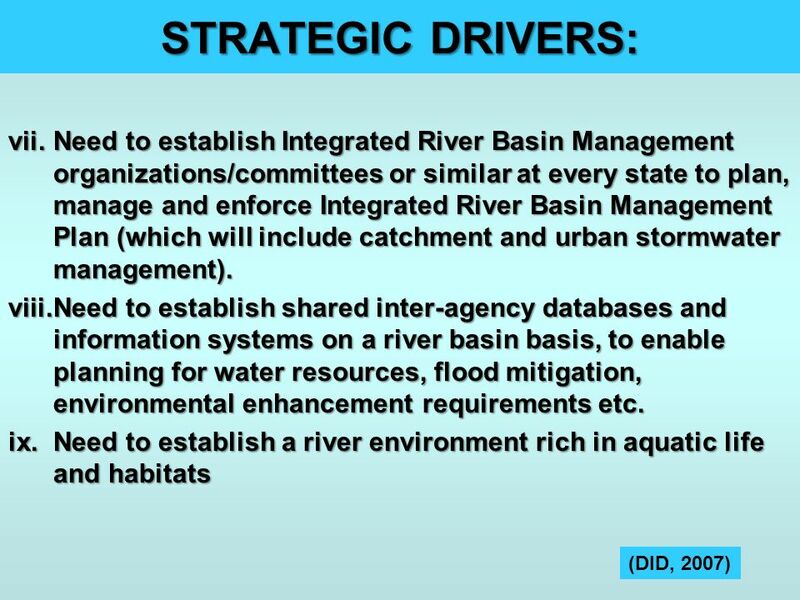 • 26 rivers identified. 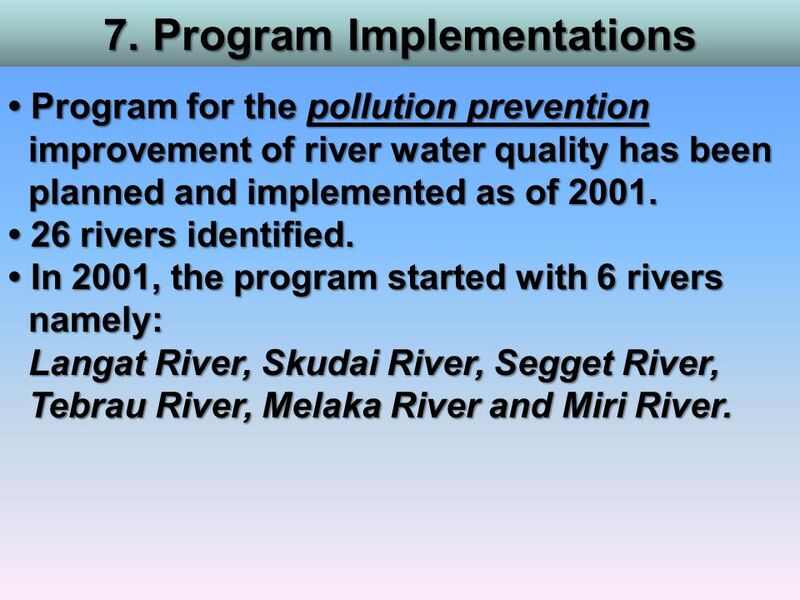 • In 2001, the program started with 6 rivers namely: Langat River, Skudai River, Segget River, Tebrau River, Melaka River and Miri River. Rajah 1. 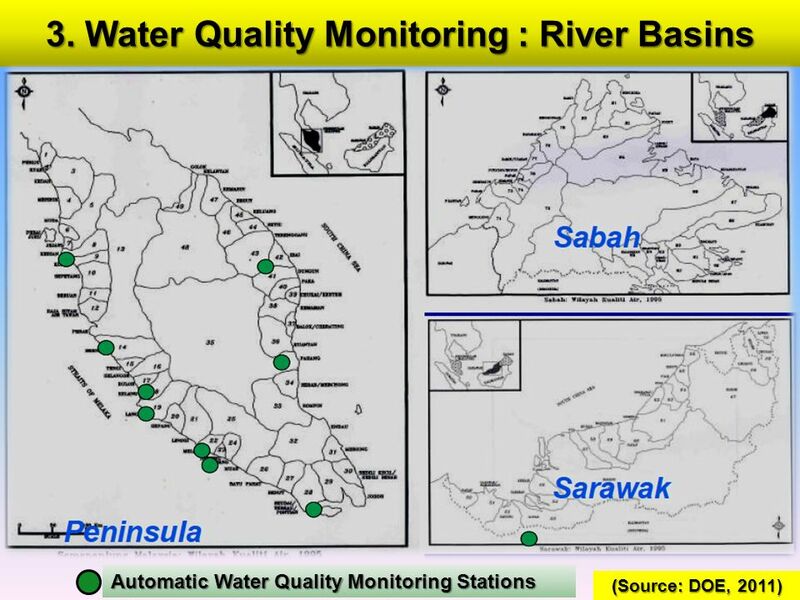 Malaysia : Lembangan Sungai yang Terlibat Di bawah Program Pencegahan Pencemaran Sungai dan Peningkatan Kualiti Air, Rancangan Malaysia ke Lapan Figure 1. 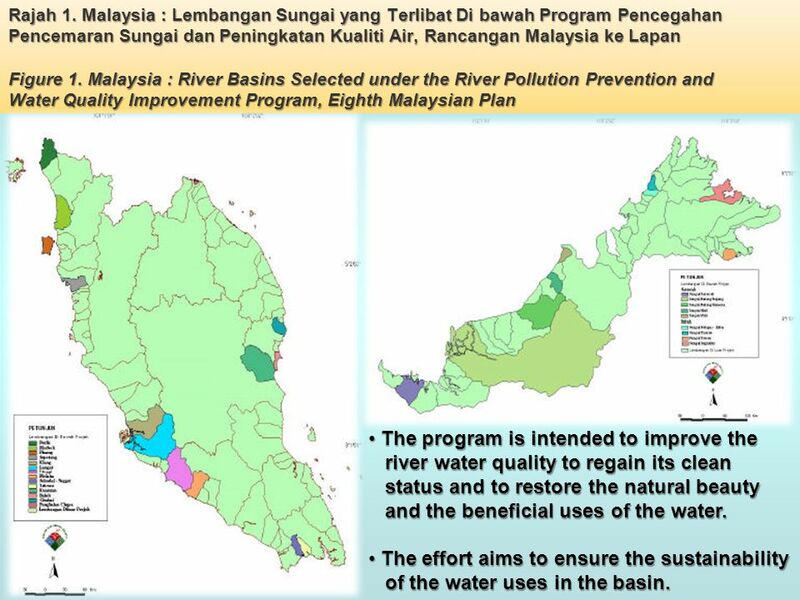 Malaysia : River Basins Selected under the River Pollution Prevention and Water Quality Improvement Program, Eighth Malaysian Plan The program is intended to improve the river water quality to regain its clean status and to restore the natural beauty and the beneficial uses of the water. 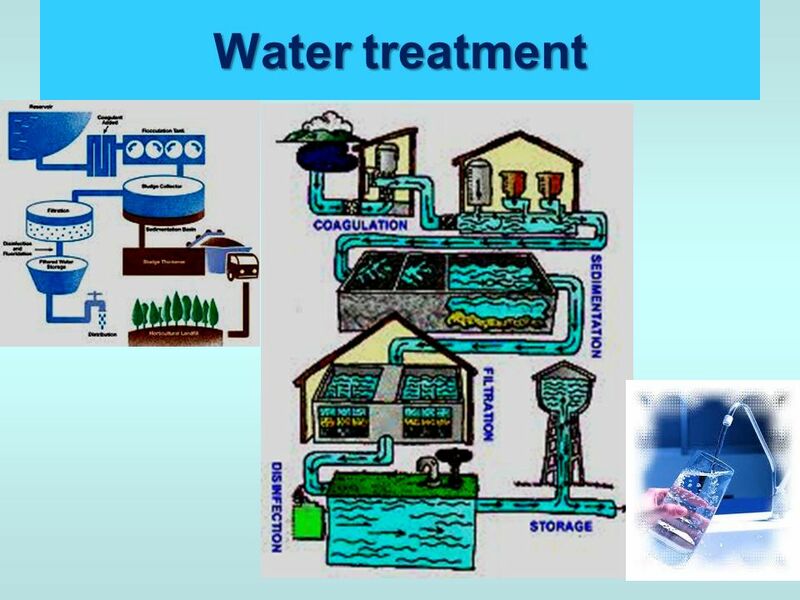 The effort aims to ensure the sustainability of the water uses in the basin. 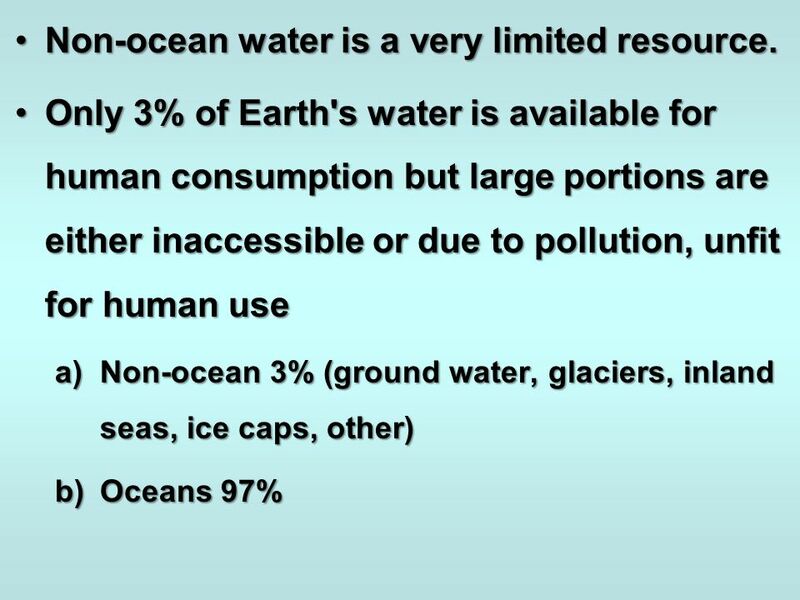 29 Non-ocean water is a very limited resource. 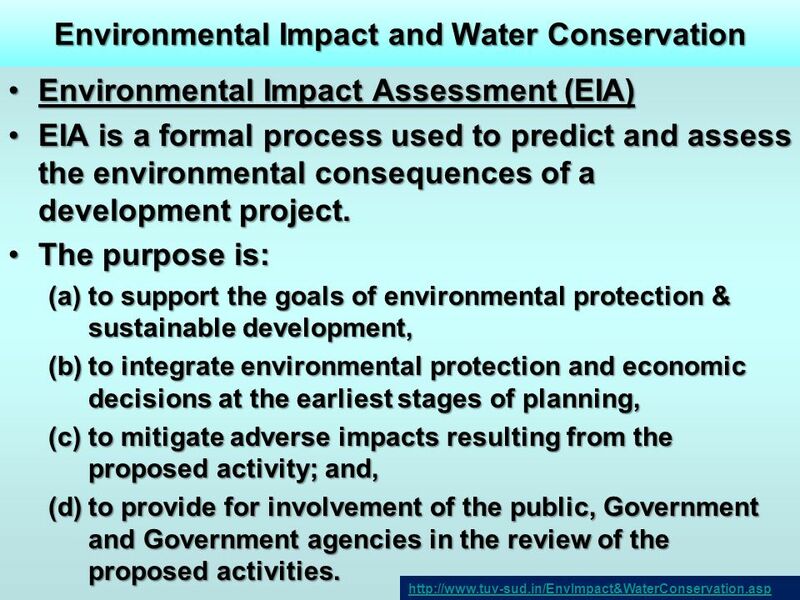 Environmental Impact Assessment (EIA) EIA is a formal process used to predict and assess the environmental consequences of a development project. 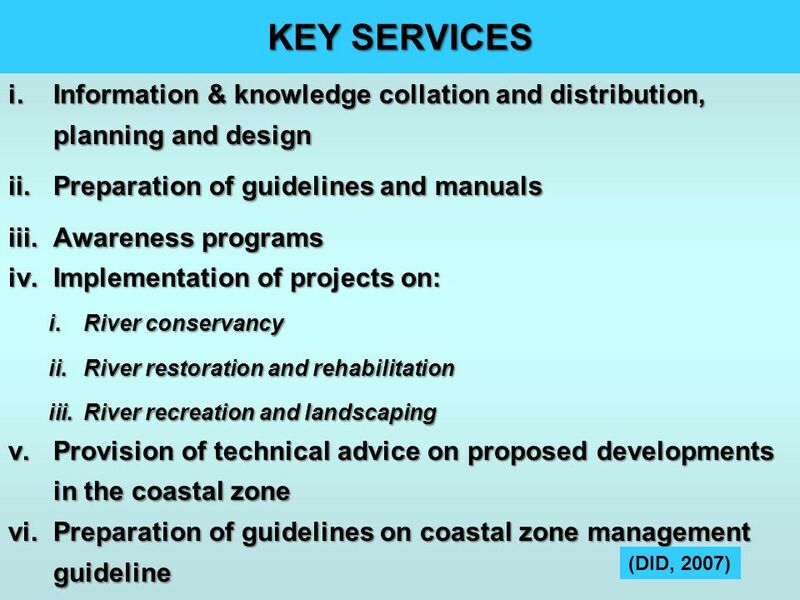 The purpose is: to support the goals of environmental protection & sustainable development, to integrate environmental protection and economic decisions at the earliest stages of planning, to mitigate adverse impacts resulting from the proposed activity; and, to provide for involvement of the public, Government and Government agencies in the review of the proposed activities. 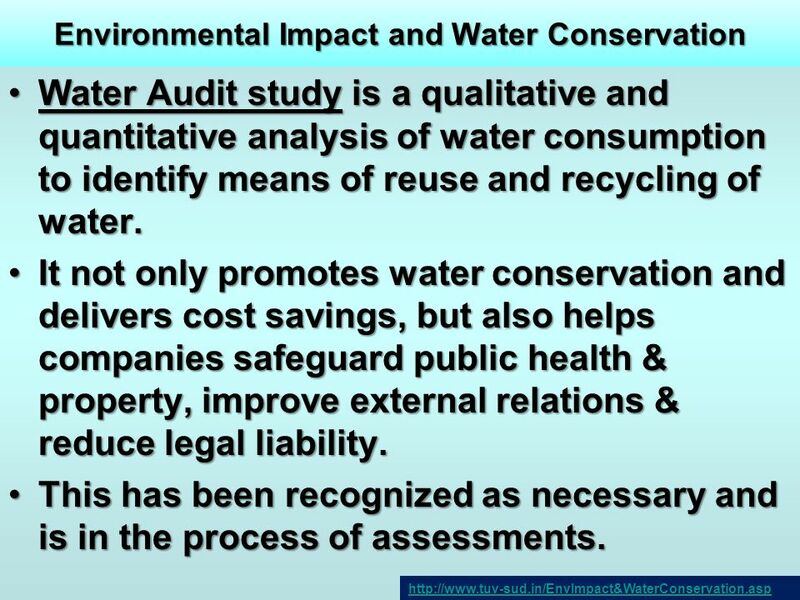 Water Audit study is a qualitative and quantitative analysis of water consumption to identify means of reuse and recycling of water. 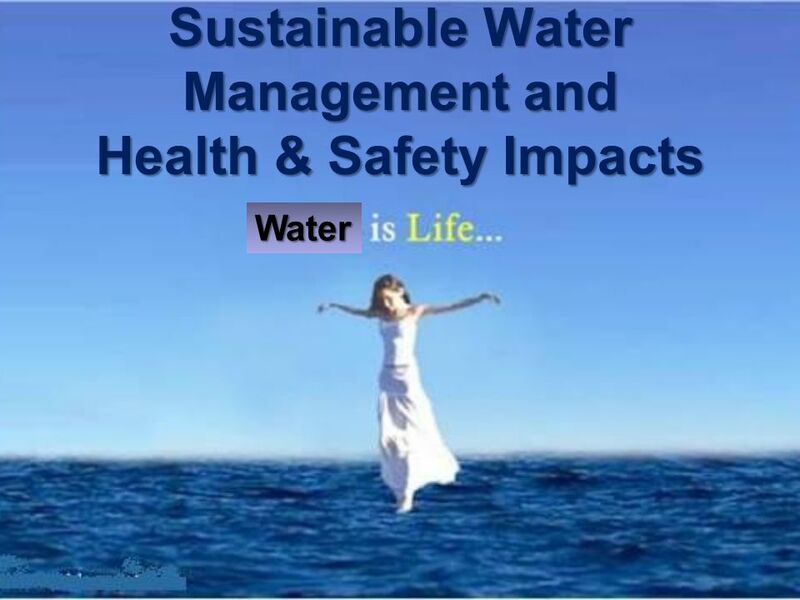 It not only promotes water conservation and delivers cost savings, but also helps companies safeguard public health & property, improve external relations & reduce legal liability. 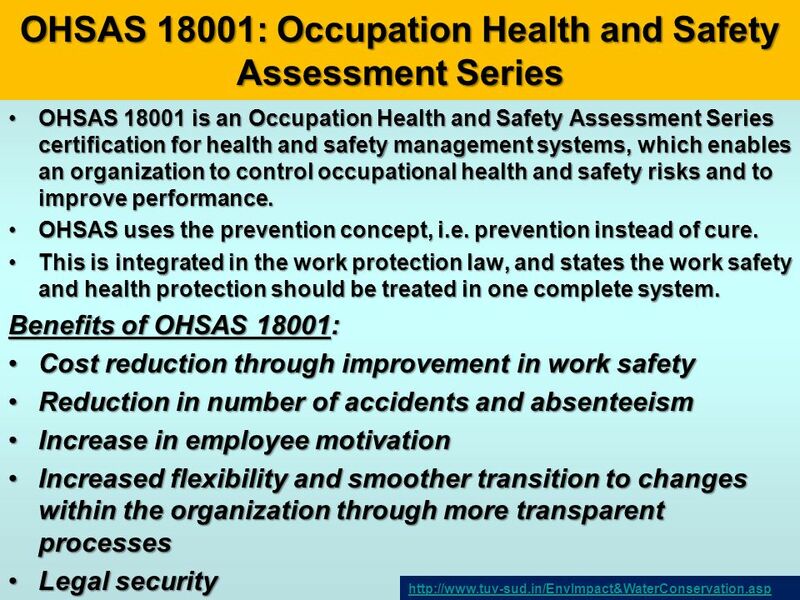 This has been recognized as necessary and is in the process of assessments. 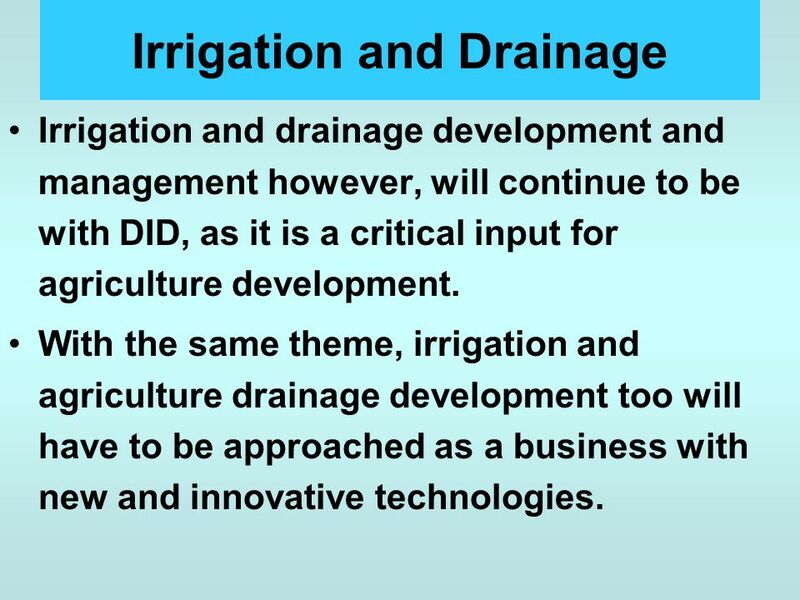 Irrigation and drainage development and management however, will continue to be with DID, as it is a critical input for agriculture development. 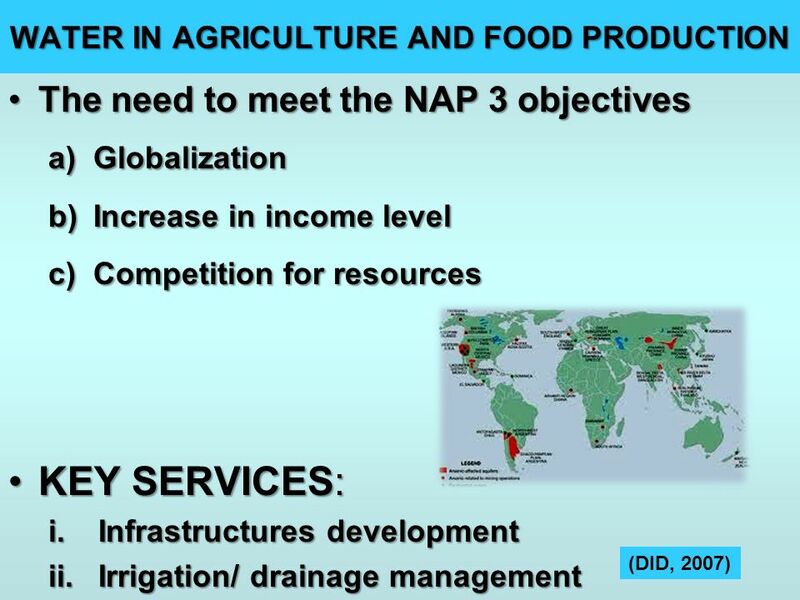 With the same theme, irrigation and agriculture drainage development too will have to be approached as a business with new and innovative technologies. 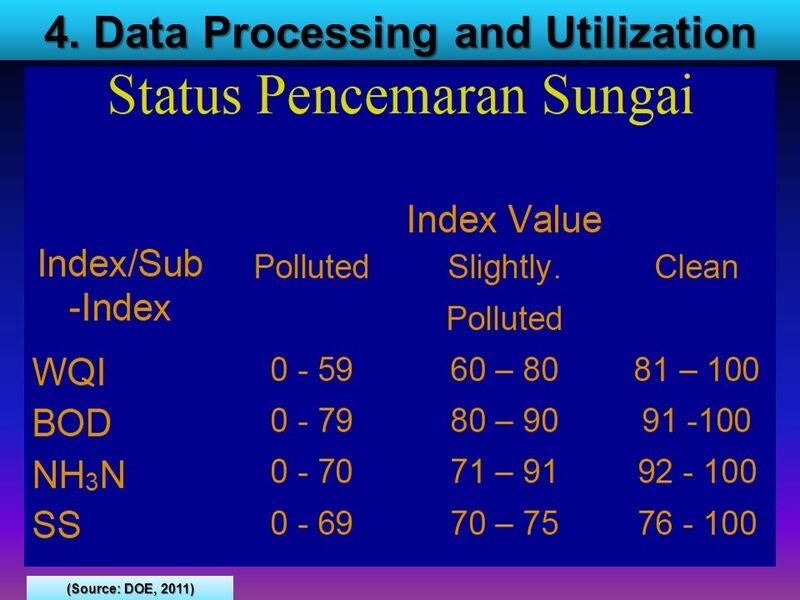 Malaysia has to operate on a performance-based system. 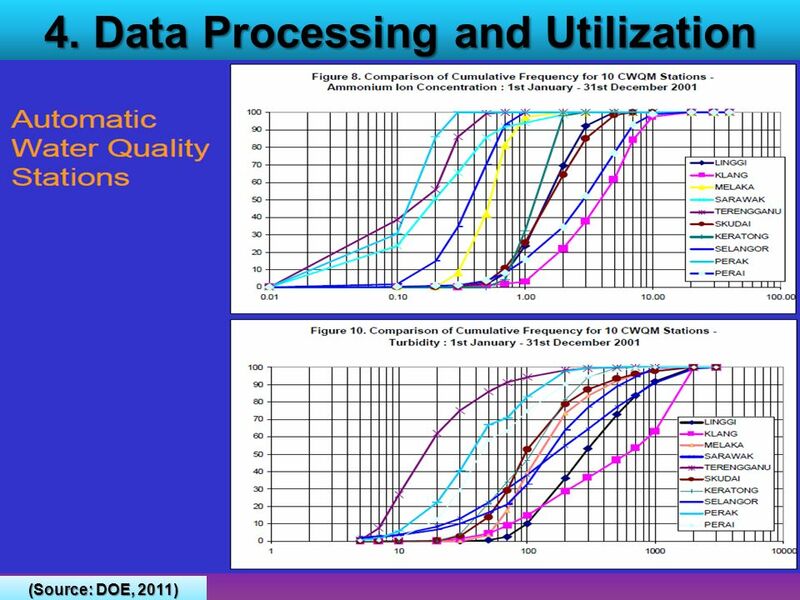 Our modernization efforts will continue and the benchmarking programs will be refined. 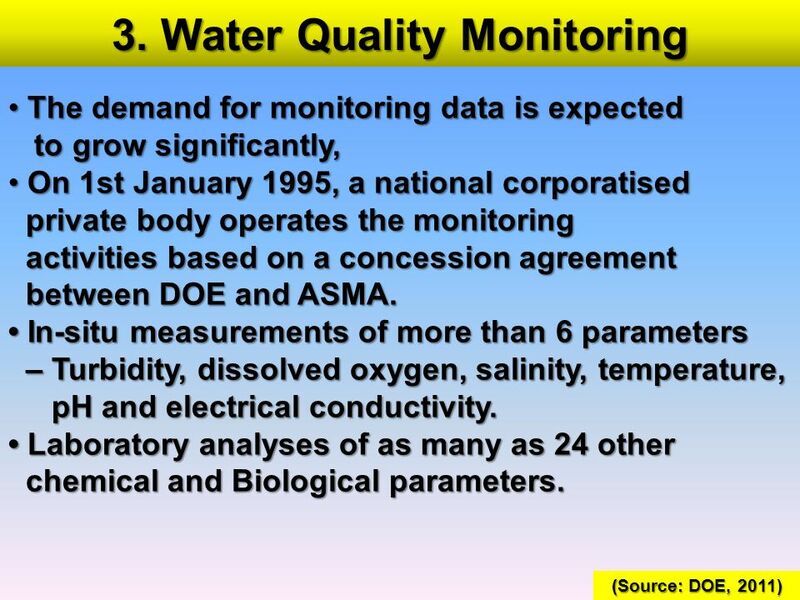 We have established key performance indicators (KPIs) for open channel system efficiency to be increased to 60% and our water productivity to be above 0.5 kilogram per metre cube of water. Efforts are already underway to study the feasibility of converting some of the open channels to pipelines. 39 Agriculture Drainage Agriculture drainage is a very important aspect of our agriculture especially when we reveived an average of 3000 millimetres of rain annually. 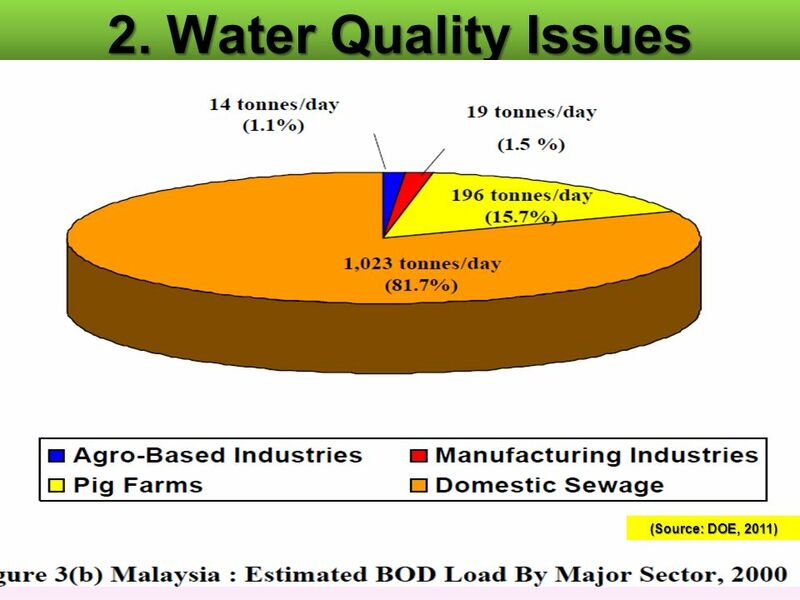 There are many successes at agricultural land reclamation and drainage projects such as the 240,000 hectare Western Johor Agriculture Drainage Project, Kalaka-Saribas in Sarawak and the coastal plains of Peninsular Malaysia. 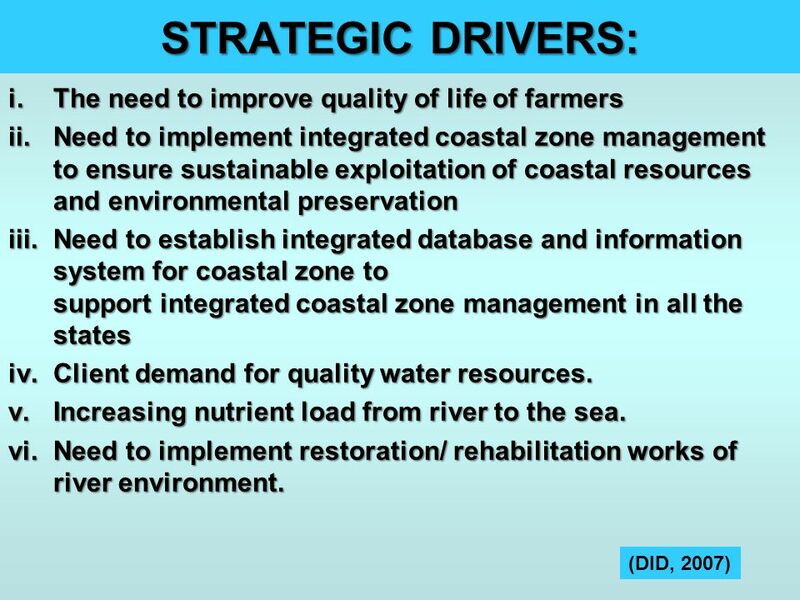 But these systems need to be refined if the objectives of the New Agriculture are to be achieved. Particularly challenging is agriculture in the peat and acid sulphate soils. 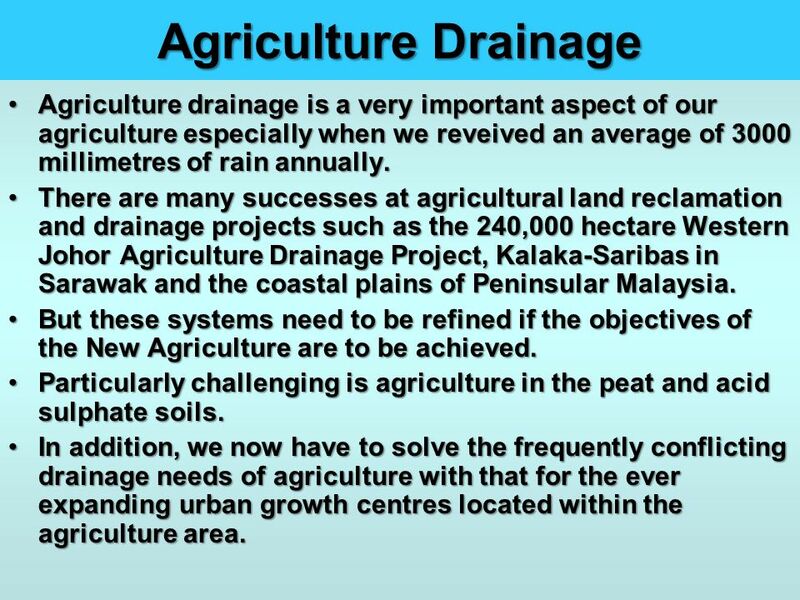 In addition, we now have to solve the frequently conflicting drainage needs of agriculture with that for the ever expanding urban growth centres located within the agriculture area. 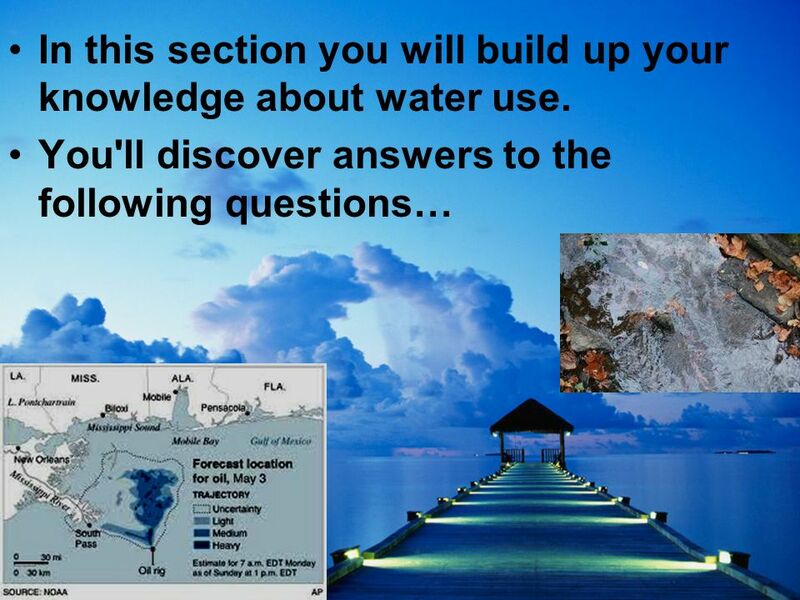 50 In this section you will build up your knowledge about water use. 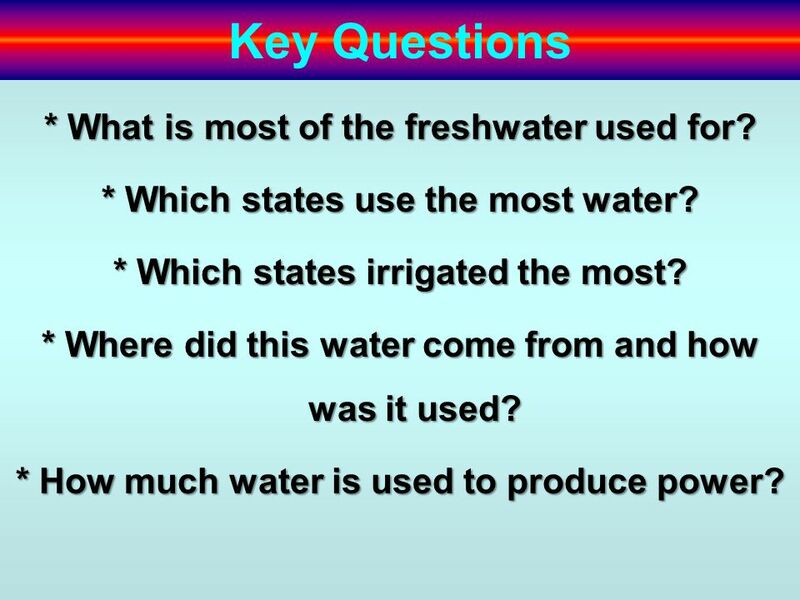 51 Key Questions * What is most of the freshwater used for? * Which states use the most water? * Which states irrigated the most? * Where did this water come from and how was it used? 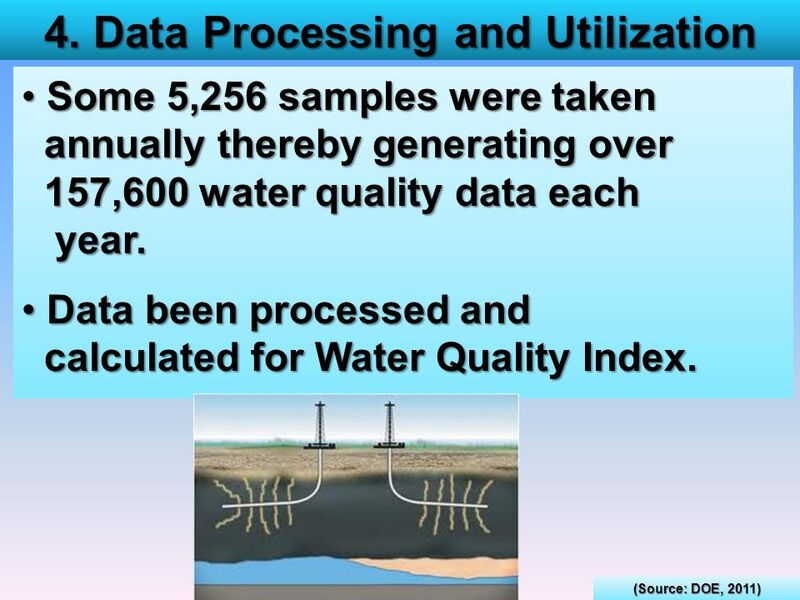 * How much water is used to produce power? 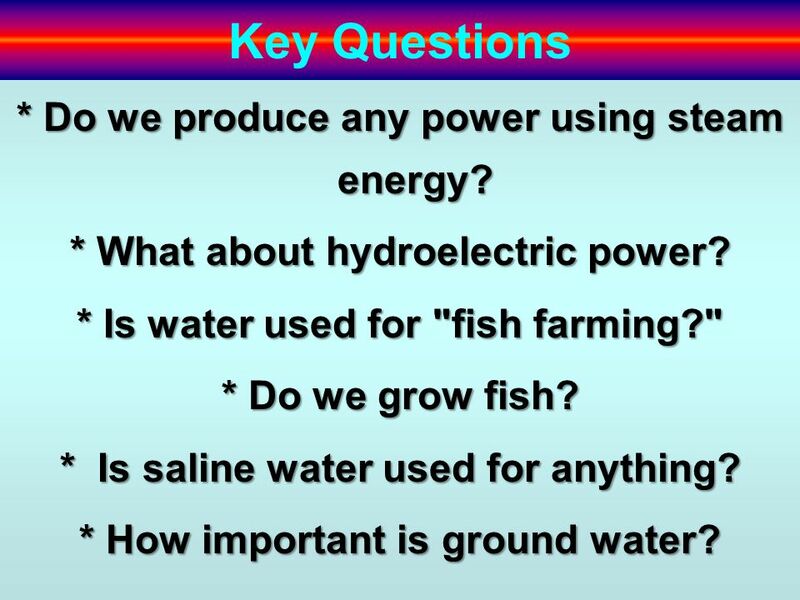 52 Key Questions * Do we produce any power using steam energy? 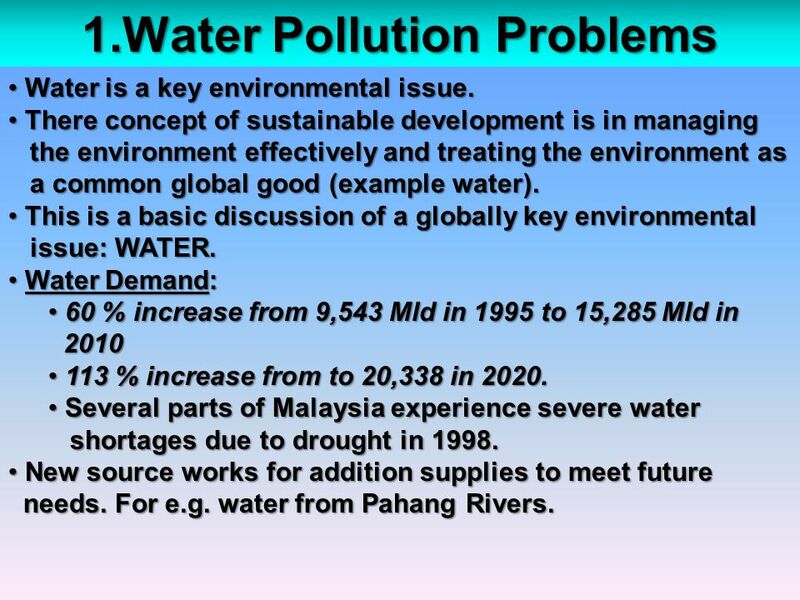 * What about hydroelectric power? 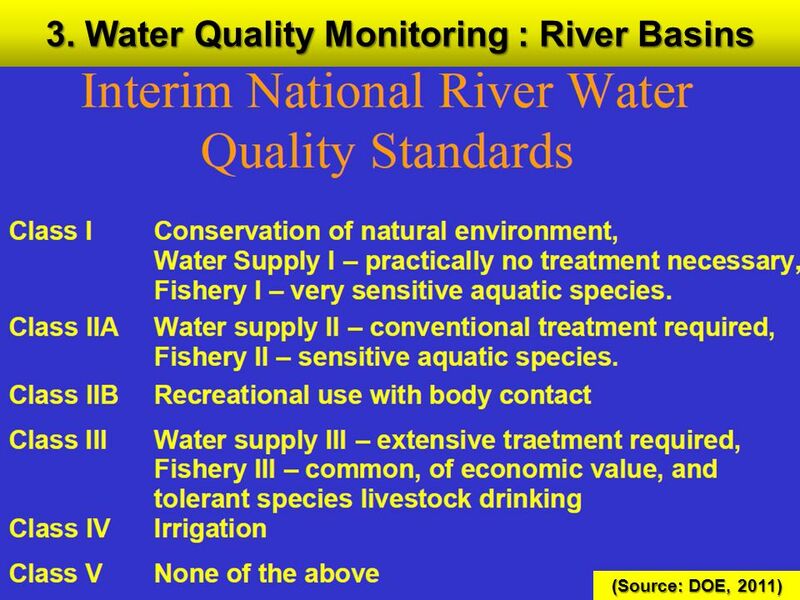 * Is water used for "fish farming?" * Do we grow fish? * Is saline water used for anything? 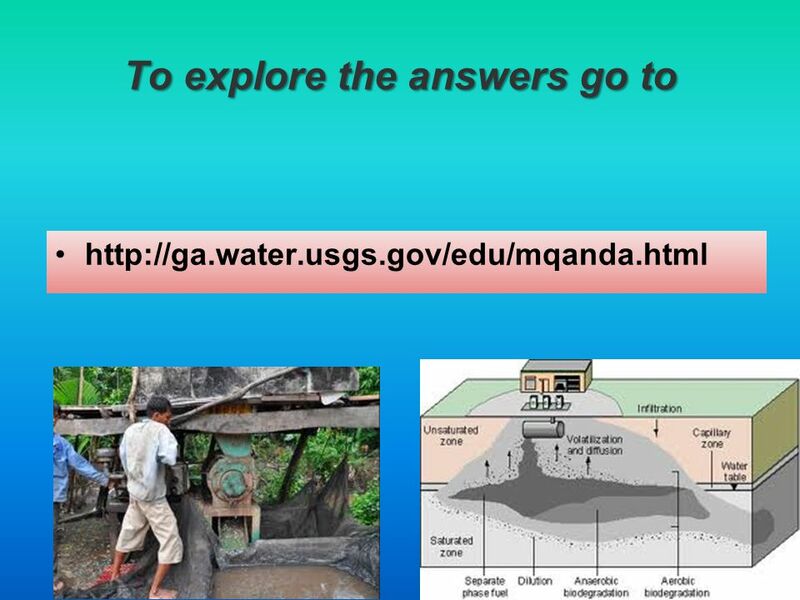 * How important is ground water? 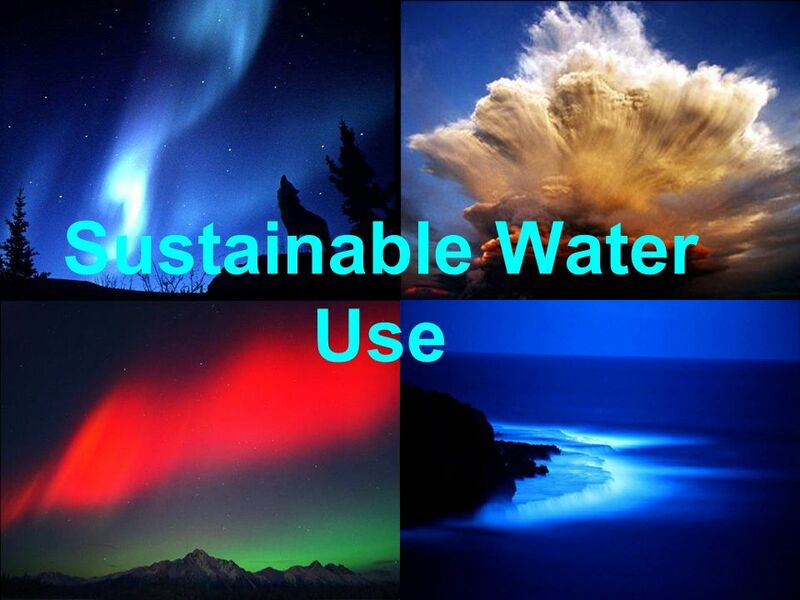 55 “What are some of the physical and chemical properties of water?" 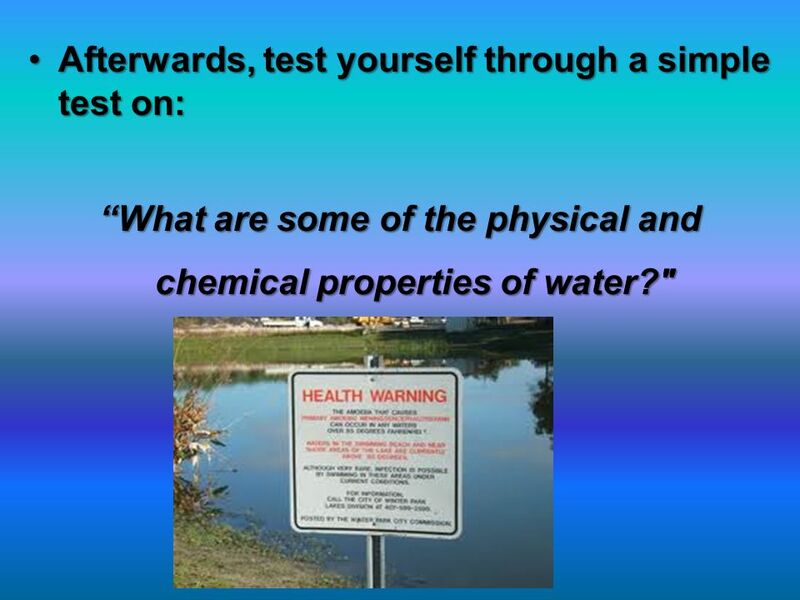 Afterwards, test yourself through a simple test on: “What are some of the physical and chemical properties of water?" although they can be expensive. 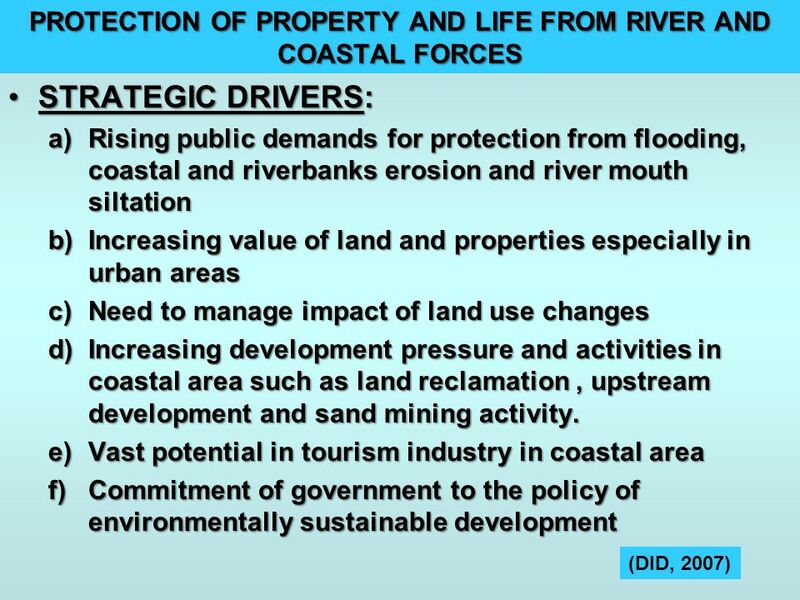 • Such activity becomes more important in the river restoration and rehabilitation works to a desired natural river conditions. 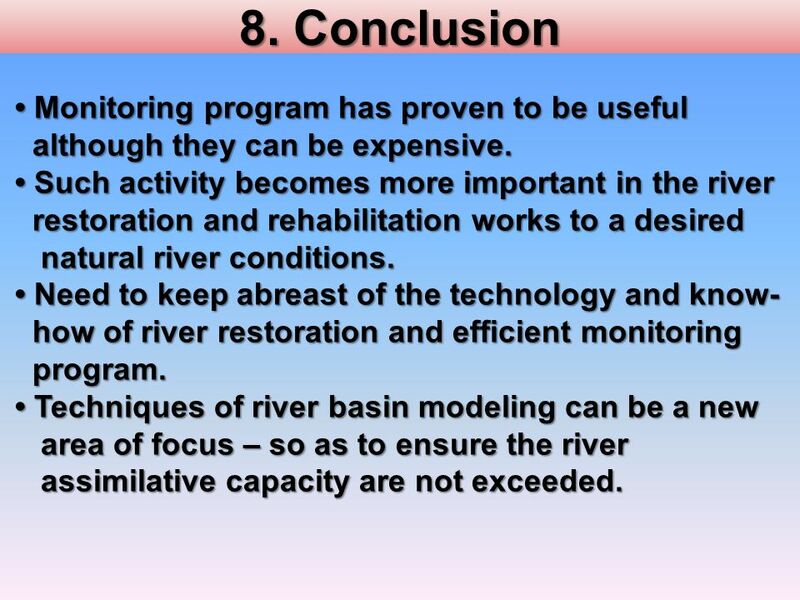 • Need to keep abreast of the technology and know- how of river restoration and efficient monitoring program. 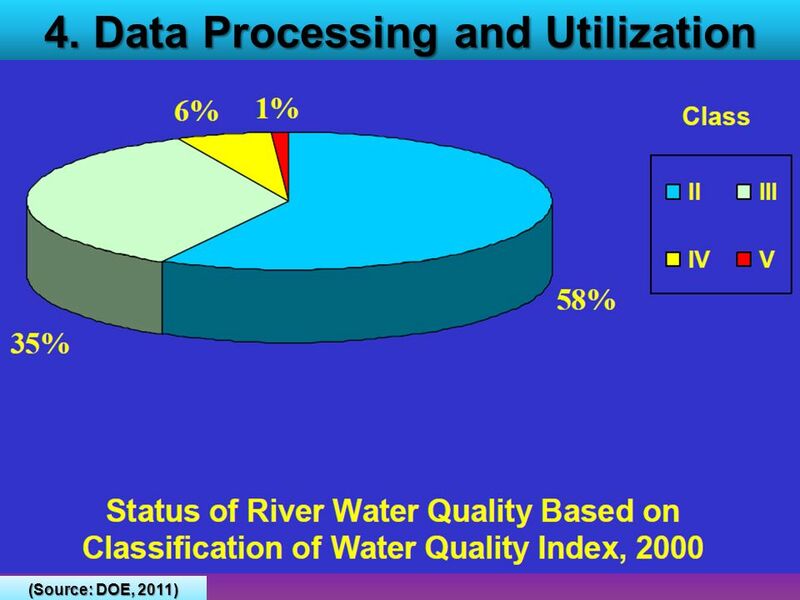 • Techniques of river basin modeling can be a new area of focus – so as to ensure the river assimilative capacity are not exceeded. 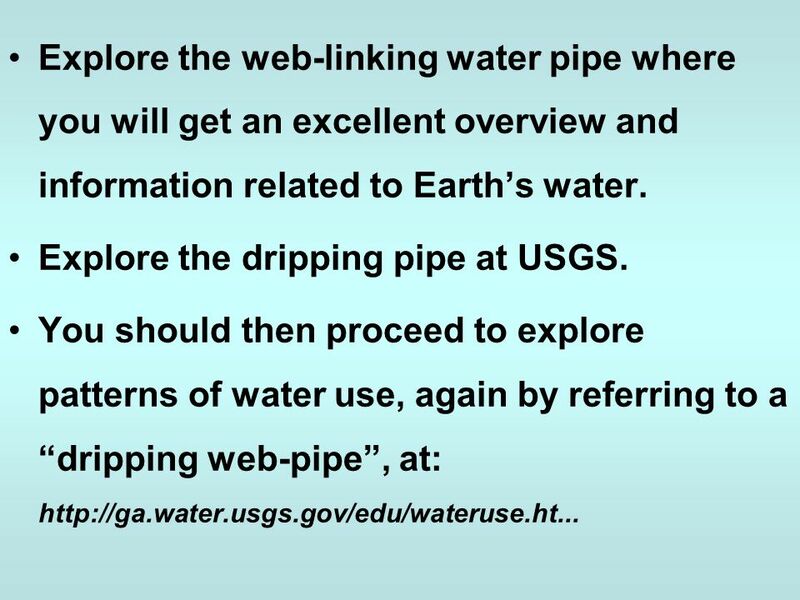 57 References USGS. (2004). 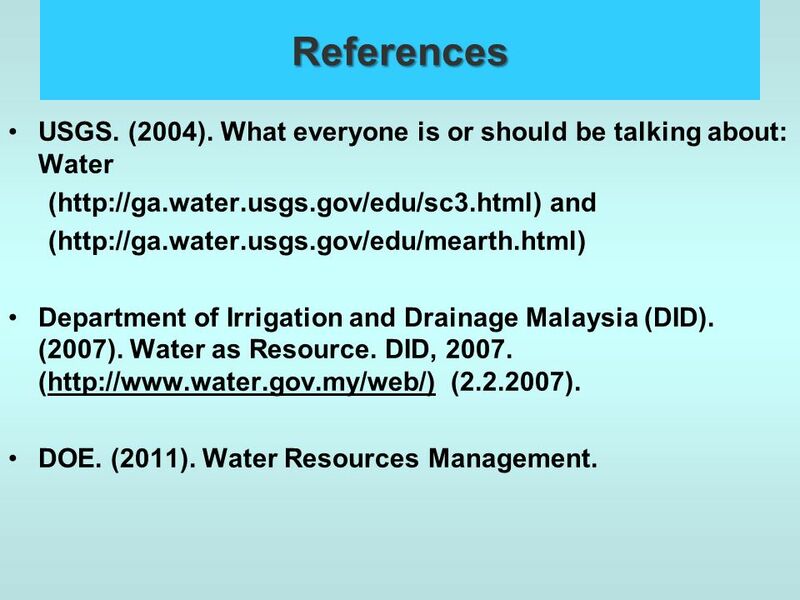 What everyone is or should be talking about: Water ( and ( Department of Irrigation and Drainage Malaysia (DID). (2007). 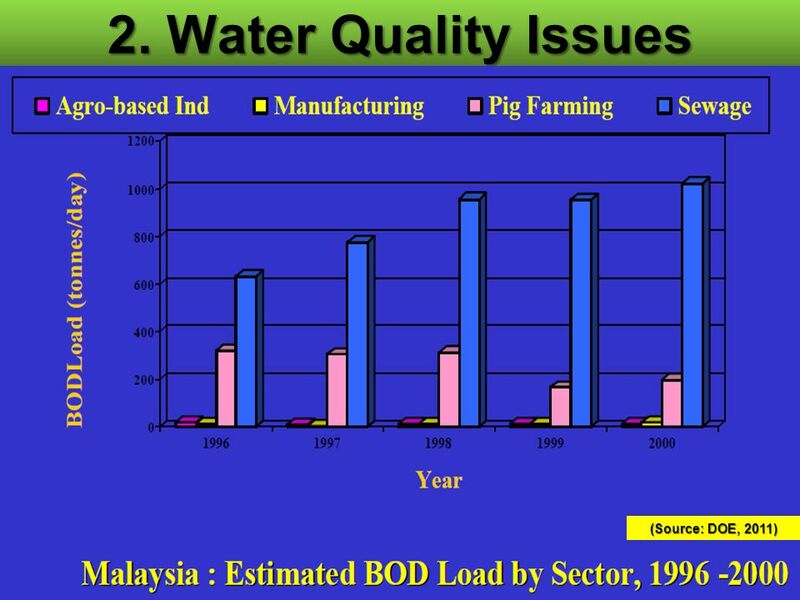 Water as Resource. 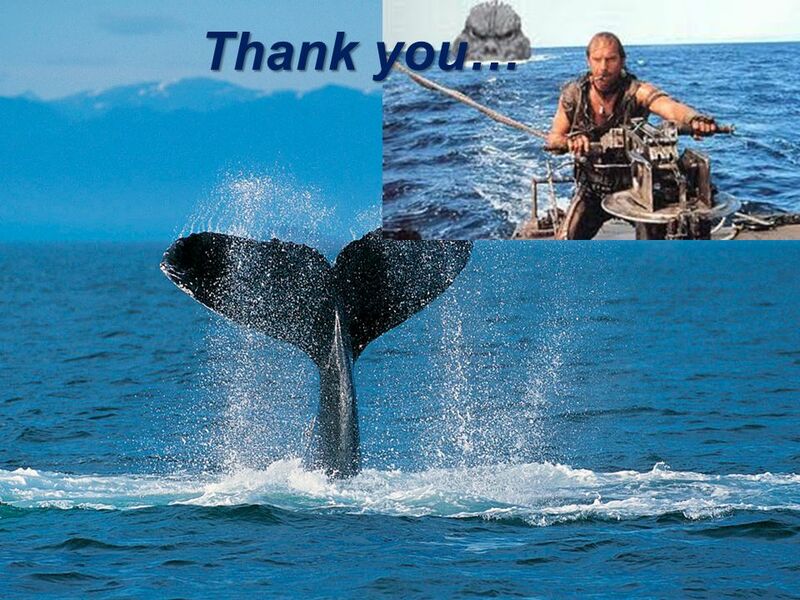 DID, ( ( ). DOE. (2011). 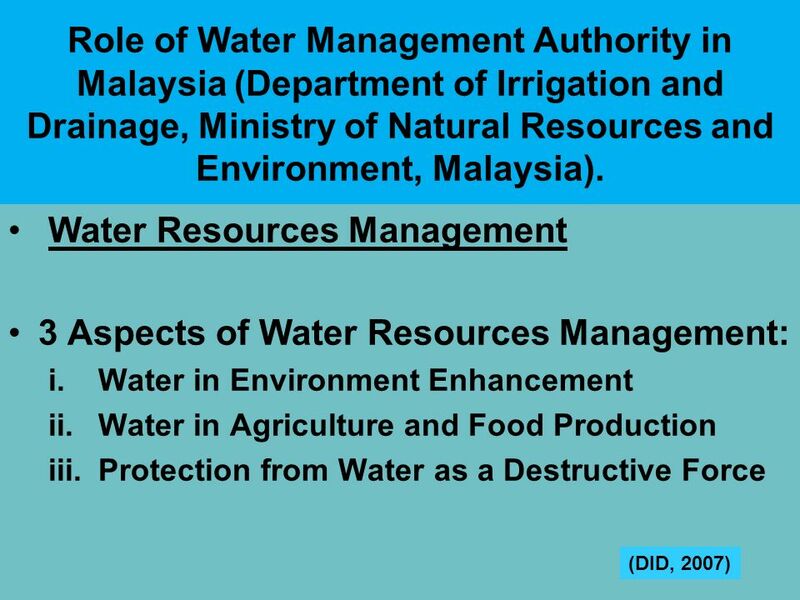 Water Resources Management. 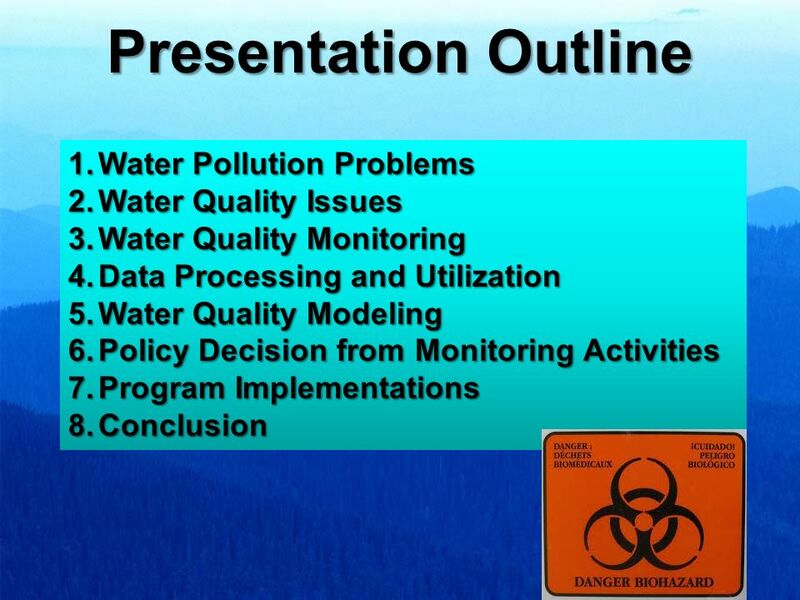 Download ppt "Sustainable Water Management and Health & Safety Impacts"
Safe and Sustainable Water Resources Research Integrate the existing Drinking Water and Water Quality research programs into one holistic program that. 2 nd International Conference Graz October, 10 th 2012 Techniques to save water quantity PP5 (LCA) PPs: LCA, LfULG, RNA. 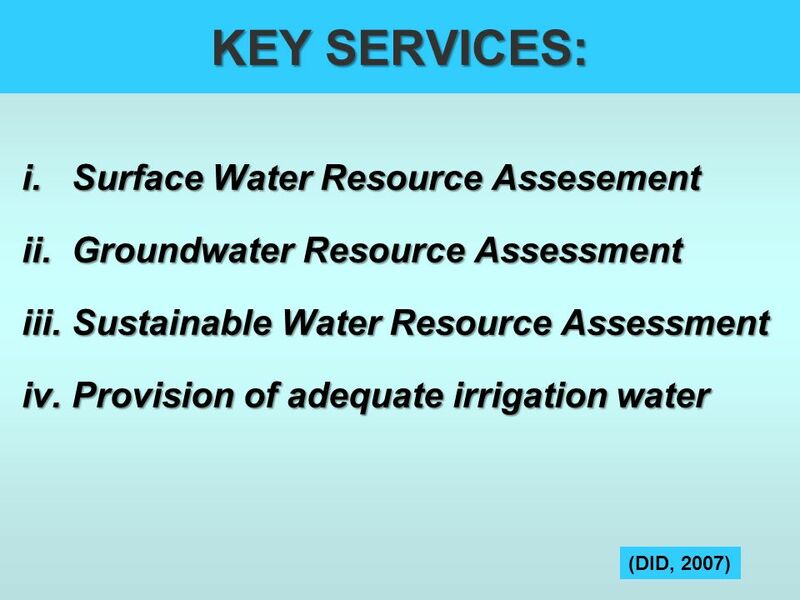 PROMOTING A COORDINATED GROUNDWATER MANAGEMENT FOR LAGOS STATE: WAY FORWARD By PROFESSOR E.O. LONGE, PhD FACULTY OF ENGINEERING DEPARTMENT OF CIVIL & ENVIRONMENTAL. 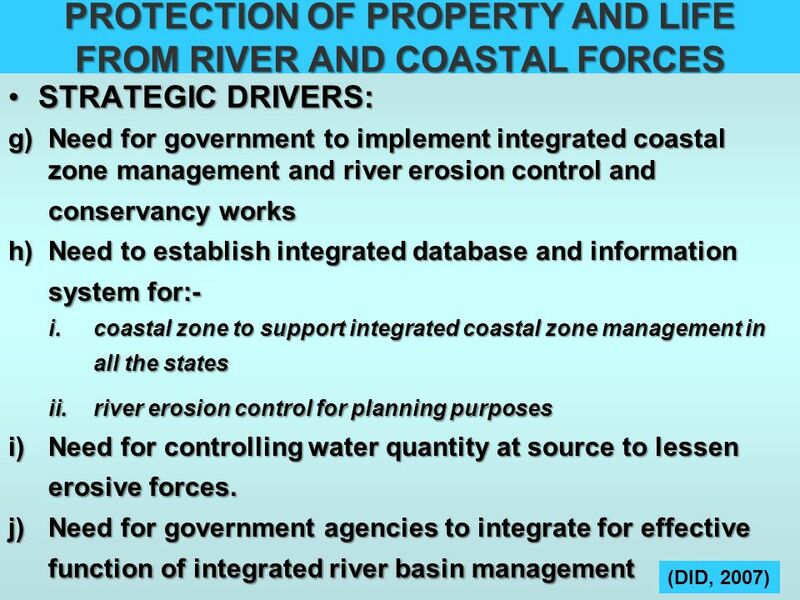 Current UK and EU Policy on Water Management Thames Tunnel Commission 29/7/11. 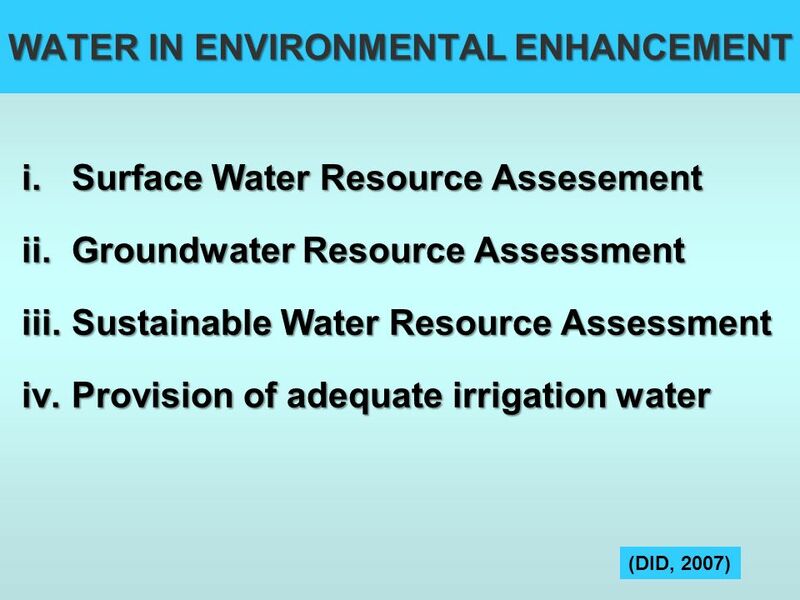 1 Europe’s water – an indicator-based assessment Niels Thyssen. Adapting the city. 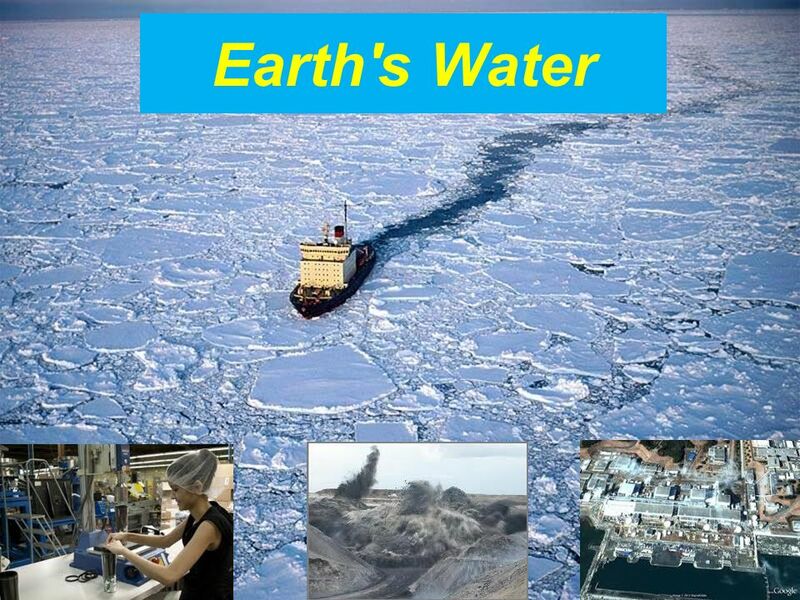 Water Infrastructure & Climate Change Chris Matthews. Are there any Supplementary Measures? Tom Stafford 5 February 2013. AGRICULTURE AND AGRI-FOOD CANADA PRESENTATION TO : The Standing Senate Committee on Agriculture and Forestry February 24, Regina. Geospatial Technology in Agriculture: Issues and Challenges Muhamad Radzali Mispan Principal research officer Malaysian agriculture research and development. State Climate Change Policy: Mitigating, Preparing, Adapting W. Spencer Reeder WA Dept. of Ecology March, 2009.